The first leg from Nairobi was very straightforward; the bus to Isiolo left more or less on time at noon, even though it spent the next hour or so cruising round the less salubrious suburbs. It was quite a fancy bus - sound system and video on board and the Western 80s rock music and reggae they played was quite a contrast to the Islamic preacher who got on board and shared his thoughts on terrorism, Bush and how Jesus was a Moslem, in fluent Swahili and English. We didn't feel so comfortable as the only non-locals on board, but no-one else seemed to be paying him much attention. The drive through Kenya's famed White Highlands - the most fertile and well watered farmland in the country, from where African farmers were forcibly removed by the colonials and the land redistributed to white settlers - was lovely. The farm tracts are large and modern farming methods are obvious even from the road. We skirted Mt Kenya, sadly covered in cloud, and arrived in Isiolo about 5pm. The connecting bus to Marsarbit left at 7, so there was time for a quick beef stew at the Mid City hotel - all going well till I spotted a dead fly in mine! At 7 on the dot the bus started, but it was far too soon to get excited. It took at least 45 minutes more to get everyone on board, including all kinds of latecomers and unaccompanied baggage, and then we drove round the corner to start the process all over again. That took another hour or so, and then it was time for the requisite fuel stop. 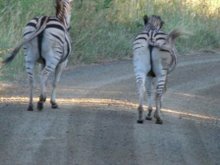 It was about 9.30 when we finally headed off, and we only got a few hundred metres when the bus pulled over. Eventually it turned out that there was a problem with the alternator, and the bus had no lights. We could see a mechanic with his torch working underneath the bus and after a while he took the part away, presumably for repairs. Max and I headed to the neighbouring hotel for a soda and a loo stop, and to read by the fluorescent light, and around 11.30 it became apparent that the bus was going nowhere that night. Along with everyone else we prepared to spend the night on board, without actually going anywhere. This was Friday the 13th. We did sleep OK, probably better than if the bus had been travelling on rough dirt roads, and about 7.30am we departed again. No need for lights, but after a brief stop at Archer's Post, just 25km or so away, the bus suffered a tyre blow out. The tyre was changed quickly enough, but it meant an unscheduled 4 hour stop at nearby Serevidu to get it repaired, as there was only one spare. Probably a good idea to fix it, considering the nature of the desert we were about to drive through and the lack of other traffic. Hanging out with some of our fellow travellers in the middle of the Kenyan desert. 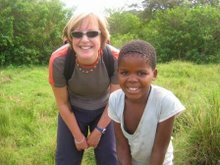 In spite of the fact that we'd just stopped for four hours, the scheduled lunch stop at the village of Laisamis still happened. It felt like we had walked into a National Geographic article. The Samburu tribespeople dominate this area; they are pastoralists like the Masai and have similar adornments but also come with large knives, spears and occasionally old 303 rifles slung over their shoulders. Women are bare breasted, with heavy beaded collars and traditional scarring on their backs and abdomen and young recently circumcised men - the warrior or moran of the tribe - walk about clanking with weaponry and jewellery. Fortunately the drive to Marsabit continued at a good pace on a not-too-bad road. We needed to get there by dark after all. 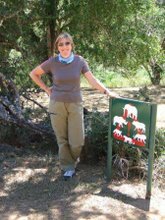 We went through the Kaisut desert - lots of camels, some with large wooden bells round their necks, and scrubby trees and vegetation - and made Marsabit by 6pm. A fellow traveller pointed out Mt Marsabit to me and told me that Lake Paradise was found at the top. Have to say my first impressions of Marsabit were less than paradise-like, in spite of catching the end of the Saturday afternoon football match, in classic soft African light. We trudged up the road to Jey Jey's Hotel, owned by the local MP and the only place to stay in Marsabit (unless you are a truck or bus driver). Dreaming of hot showers we were distressed to see that, due to a water shortage, the showers, basins and toilets no longer had running water. However, the hotel did rustle up two plastic basins of hot water for us to wash with, which was very welcome. Jey Jey's was a pretty reasonable 400Ksh (about $NZ8), and comfortable and clean - we felt so good after our hot wash that we ventured back into town, had a quick Tusker at the Mountain Bar, and then tried to find out about transport for the next day to Moyale. Answers ranged from: early in the morning, 10-11am, early afternoon, round 4pm, not on a Sunday. Someone is bound to be right, but who? We were up early the next morning (in case the person who said trucks left at 6am was right), and headed down to the square opposite the football field and then to the filling station to enquire about transport. It did seem to be becoming clarified that the trucks left from the square round 4pm, after they'd driven up from Nairobi. We went back to Jey Jey's for breakfast and then headed to the A2 highway to see if we could flag a lift in a 4WD. Most traffic was either heading back to Isiolo, driving around town, or resolutely ignoring us! Ah well. We had a pilau and chapati lunch at Mum's Cafe and around 2pm a couple of trucks started to gather in the square. Max went to negotiate and got us on one that was due to depart at 4. He haggled the price down to an acceptable 400Ksh each, close to what the locals pay and much better than the 1000Ksh he was originally quoted. 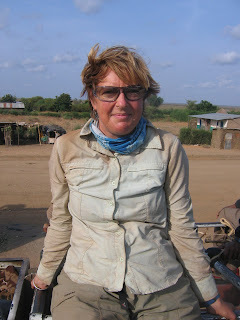 Marsabit is a dusty and windy place - only the second time I've put my GoreTex jacket on this whole trip. It warmed up later in the day, but seemed to me to be one place where a full face veil actually made sense. This part of Kenya is pretty much Moslem, and there are lots of women fully covered, and even men in cloth head gear too - haven't seen this much before. About 3.30 we climbed on board - no mean feat in this classic cattle truck, high off the ground with a metal frame and heavy tarpaulins draped over the back two-thirds. On the front third of this frame young men balanced themselves. It was all pretty hair-raising stuff and I was relieved to learn that the truck stopped en route and didn't drive through the night. We initially settled ourselves comfortably enough towards the back of the truck, which was carrying around 40 passengers. 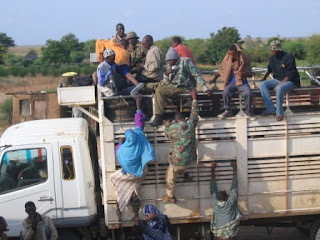 There is no scheduled bus service on the Marsabit-Moyale route - just the trucks. With the number of people using them (our truck was one of five - but the others also carried some freight), it seemed crazy to me that no bus company ran a service. We were joined by two young soldiers in the back, just before the convoy departed. The road went from bearable to unbelievably rough and bone shaking - our experience wasn't helped by our position over the rear axle. We were several times airborne, and anxiously hoped that the soldiers' guns didn't accidentally go off. The thought of bullets ricocheting around the metal truck wasn't good. Thankfully we were at Turbi (our overnight stop) after about 3 and a half hours, hard to know if we could have stood the whole journey in one go. There were a number of stops, for checkpoints and villages, and I was grateful for all of them. Our truck drove into a hotel compound, and we were shown a dirt floored and walled room with two beds, given a candle, and had the tin shed that housed the long drop pointed out to us. That's us all settled in then! A few Wet Wipes took care of the dust (there's no water here at all for washing), and we repaired to the dining room (!) for a cup of chai and to read. No chance. We were the object of much attention - firstly from Ali Bala, the local medical expert (also the recipient of a carton and a labelled cabbage we'd carried on the truck) who proudly told us he'd studied at the Max Planck Institute in Germany. He was called away to assist with a tricky childbirth and next up was Halake, who shared with us all the grisly details of the Turbi Massacre of 12 July 2005, when (according to Halake anyway) 800 Borena from Ethiopia, looking for land for their cattle, came across the border and killed over 65 local women and children. It sounded incredible that this sort of thing could happen in this sleepy, simple place. We just missed the second anniversary commemoration, and wondered if there was a connection between this incident and the ensuing increase in security on this previously unsafe road. After a pretty long day, we hit our hard little beds round 9, lit a mossie coil, and slept like babies till the alarm woke us at 5.30. It's not that easy to climb on board, as you can see, nor the cleanest way to travel. Today will, all things being equal, be our last day in Kenya. Ethiopia by lunchtime we told ourselves! We had decided to see what it would be like sitting at the front of the truck, perched up high on a steel bench at the rear of the cab, facing backwards. At least we would be able to see the countryside. 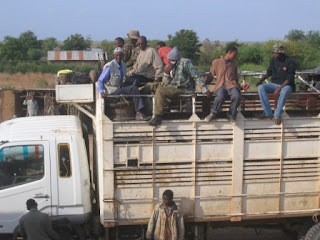 We'd been told that most people would get off at Turbi (hard to see why), but by the time we'd collected two new soldiers and the convoy had convened by the road block, the truck was fuller than ever. It was also pretty damn uncomfortable - the fairly frequent stops were really welcome, as much for the respite as for the general interest. The villages between Turbi and the border were larger and more numerous than I had thought they would be in this rainless, remote and apparently dangerous part of the world. Danger went through everyone's mind at one point of the 3 hour journey when we saw a line of half a dozen armed men at the foot of a small hill, and another half a dozen at the brow. It looked ominous to us - and obviously also to our driver who unhesitatingly did a U-turn. The truck behind us had the advantage of a soldier with binoculars and they decided the threat was minimal and gunned their truck through the lines of men, who scattered. We followed in their wake and saw the men gesticulating and holding their spears, but that's all. 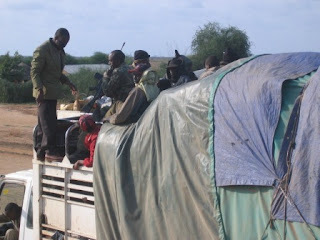 The chatter in our truck subsided: the only word we could understand was Shifta - the name given to the Somalian bandits who made this road a no-go zone till fairly recently. A bit of excitement and a moment to wonder "what if" before getting back to the business in hand of keeping as dust-free as possible (rapidly becoming a joke), retaining a couple of handholds for which there was much competition, and moving around to settle myself more comfortably on the hessian back of gumboots I was sitting on. Large numbers of pretty, pale skinned, single humped camels marked the start of the outskirts of Moyale - a surprisingly big town that sprawls across the Kenya-Ethiopia border. Ethiopia by lunchtime we'd said to ourselves this morning, and after completing various immigration, registration and money changing formalities on both sides, we found ourselves there by 12.20 - or 6.20 in local time. Not only does Ethiopia still run on the Julian calendar (which means they will celebrate the millennium on 11 September this year), but noon and midnight are 6am and 6pm respectively. Along with this complication, suddenly English is no longer widely spoken, and the Amharic script will take some figuring out. It was a bit of a walk up the hill to find a hotel followed, and eventually we settled upon the Belayne which had the advantage of being across the road from the bus depot. The buses to Addis Ababa depart at 6am, so no point getting up any earlier than necessary. We both took a much needed shower under a cold trickle of water and then headed off to find some lunch. We had heard about Ethiopian food, and were keen to try some ... back down the hill we found an OK restaurant and were soon tucking into a plate of kai misto and injera - spicy meat stew and tef pancake (the latter was definitely an acquired taste), and a bottle of Harar beer. We had been hot, tired, sore, filthy and hungry when we got here, but after a shower and a change of clothes, and something to eat and drink, we were feeling fantastic again. Back at the hotel I tried out my newly acquired Amharic and ordered coffee. We got one glass of black coffee and one cup of hot steaming milk! Close but no cigar.